Not at the price shown I hasten to add, getting it direct from the current owner. It has some very nice mods and should make a nice daily rider. Odd power figure, the manual says 49bhp standard. The wheels are horrid too, but I like the colour scheme. I wonder if the race brakes are expensive? The ones on mine look the same. The bhp figures are at the back wheel. That would make it approximately 54-56 at the crank. I would wonder how many of them fresh from the factory, if dyno'd, would make anywhere near the claimed 49 bhp (at the crank ?). So 46 at the back wheel is I believe pretty reasonable. If you take into account the other nice mods like forged rods/ c/r gear box/clutch/belt primary/gas flowed head/ half race cam etc. etc. in the engine it is pretty high spec. The racing Lockheed AP callipers are £150 each (I know because the Seeley has them) and chalk and cheese compared to the std. items and the front brake master cylinder is a crazy £300+. I'll get to take it for a ride in the next week so I'll get back to you on how it performs. I'd always assumed bhp referred to wheel horsepower for some reason, live n learn etc. ive got a set of them cma wheels for my suzuki. mine are fitted with fooking massive disks! Well done mate, I not keen on the wheels but the bike does look nice. I was considering a T150/T160 I must admit but they are a deal more expensive when in the same condition as this T140. 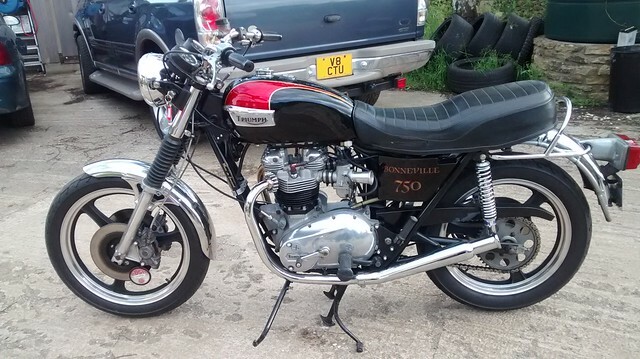 This has some nice mods and goes pretty well and will fit my "tottering around the lanes, with the odd thrash" remit. I have admitted that I no longer have the desire to blast around at high speed anymore, if I feel like it I have the Suzuki SV1000S for that . Take your point on the CMA wheels, they were probably the Bees-Knees when they were fitted back in the day but I would prefer a set of flanged Ali numbers by choice. 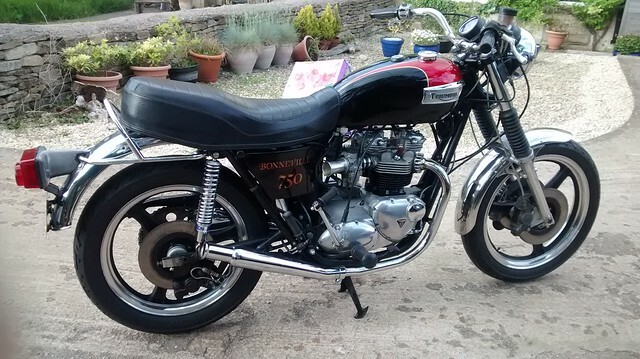 Saying that, this does not need anything doing to it to provide a nice daily rider (apart from a carb clean/service etc.) so I intend to enjoy the ride rather than get straight into a major re-fit. The Seeley racer is providing all the workshop time I can handle at the moment anyway . have a 79 myself and have had it since 84.